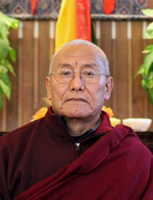 Lama Tsering Gyaltsen is a disciple of Dudjom Rinpoche who came to the United States at the invitation of Chagdud Tulku Rinpoche and Lama Tharchin Rinpoche. Born in Western Tibet in 1945, Lama Tsering Gyaltsen Rinpoche went into exile to India with his family at the age of 16, where they lived in a settlement for refugees. He attended the Varanasi Tibetan Institute of High Studies within Sanskrit University and, in 1982, he received an Acharya degree. This page was last edited on 5 July 2014, at 16:25.